On January 27, 1980, the American diplomats, now travelling on Canadian passports, boarded a flight for Zürich, Switzerland, at Tehran’s Mehrabad Airport. They arrived in the friendly nation safely. The Canadian embassy was then closed that day, with Ken Taylor and remaining staff returning to Canada. Ambassador Taylor, Sheardown, and their wives, Patricia Taylor and Zena Sheardown, along with embassy staff members Mary Catherine O'Flaherty, Roger Lucy and Laverna Dollimore were awarded the Order of Canada, Canada’s highest civilian award. Zena Sheardown, a Guyanese-born British subject, would normally have been ineligible, but was awarded the membership on an honorary basis due to the intervention of former External Affairs Minister Flora MacDonald. Ambassador Taylor was subsequently awarded the Congressional Gold Medal by the United States Congress for his assistance to the United States of America. Jean Pelletier, Washington correspondent to the Montreal La Presse newspaper, uncovered the situation before the “Canadian Caper” had reached its conclusion but refused to allow the paper to publish the story in order to preserve the safety of those involved, despite the considerable news value to the paper and writer. Pelletier’s story ran as soon as he knew the hostages had left Iran, but by exposing the operation, demolished plans by the U.S. to secretly house the six Americans in Europe while the hostage drama continued. The Argo story was blown, but the CIA role was kept secret by both the U.S. and Canadian governments at the time for the safety of the remaining hostages; its full involvement was not revealed until 1997. Officially, the U.S. had maintained for negotiation purposes that all of its missing diplomats were held hostage, so the rescue came as a complete surprise to the public. 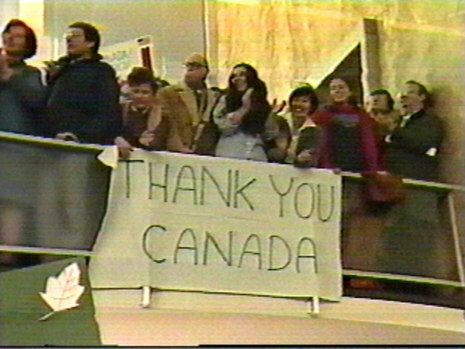 American gratitude for the Canadian rescue effort was displayed widely and by numerous American television personalities and ordinary people alike. Thousands of businesses flew the Maple Leaf flag or changed their outdoor signage to phrases like “Merci Canada,” and Canadian tourists were treated to free meals and hotel stays. 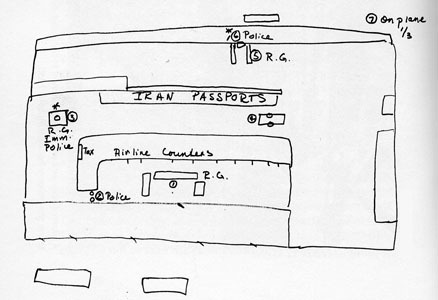 On January 29, 1980, the six Americans who for several months had found refuge with Canadian diplomats in Tehran were whisked away in a successful undercover CIA mission from the revolution that had engulfed Iran. The six Americans returned to a hero’s welcome to the United States during what had otherwise been a period of successive disappointments for U.S. diplomacy, transfixed at the time on the fate of more than fifty Americans still held hostage in Tehran following the storming of the U.S. embassy nearly three months earlier.